A CentOS 7 server with a non-root, sudo-enabled user, and a basic firewall set up. This (and more) is all covered in the New CentOS 7 Server Checklist. Optionally, the nano text editor. This tutorial will use nano throughout and you can install it at any time with sudo yum -y install nano, or substitute your favorite text editor. CentOS 7 doesn't have a mosquitto package by default. To install it, we'll first install an extra software repository called Extra Packages for Enterprise Linux, or EPEL. This repository is full of additional software that installs well on CentOS, Red Hat, and other enterprise-oriented Linux distributions. Log in with your non-root user and use the yum package manager to install the epel-release package. This adds the EPEL repository information to our system. The -y option automatically answers yes to a few prompts throughout the process. Now we can install the mosquitto package. The package comes with a simple default configuration, so let's run it to test our install. Now let's test the default configuration. The mosquitto package comes with some command line MQTT clients. We'll use one of them to subscribe to a topic on our broker. Let's Encrypt is a new service offering free SSL certificates through an automated API. The official Let's Encrypt client is called Certbot, and it is included in the EPEL repository we installed in the previous step. Certbot needs to answer a cryptographic challenge issued by the Let's Encrypt API in order to prove we control our domain. It uses ports 80 (HTTP) and/or 443 (HTTPS) to accomplish this. We'll only use port 80, so let's allow incoming traffic on that port now. Use firewall-cmd to add the HTTP service. Reload the firewall so the changes take effect. EDITOR=nano will make the crontab file open in the nano editor. Leave it off if you'd prefer the default vi editor. You should now be presented with the default crontab, a blank file. Paste in the following line, then save and close the file. --post-hook "systemctl restart mosquitto" will restart Mosquitto to pick up the new certificate, but only if the certificate was renewed. Now we'll replace the default configuration file and tell Mosquitto to use this password file to require logins for all connections. First, delete the existing mosquitto.conf. And now open a new, blank config. Try to publish a message without a password. To enable SSL encryption, we need to tell Mosquitto where our Let's Encrypt certificates are stored. Open up the configuration file we previously started. Before we restart Mosquitto to load the new config, we need to fix one thing in the default mosquitto service file. This is the file that systemd uses to determine how to run mosquitto. Open it in your favorite editor. Look for a line that says User=mosquitto and remove it, then save and exit the file. Mosquitto will still run as the mosquitto user, but when it first starts up, it will have root privileges, and will be able to load our Let's Encrypt certificates (which are restricted to root access, for security reasons). After loading the certificates it will drop down to the mosquitto user. We need to reload systemd itself, so it notices the changes we made to the service file. And now we can restart Mosquitto to update the settings. Now we test again using mosquitto_pub, with a few different options for SSL. mosquitto_pub -h mqtt.example.com -t test -m "hello again" -p 8883 --cafile /etc/ssl/certs/ca-bundle.crt -u "sammy" -P "password"
--cafile /etc/ssl/certs/ca-bundle.crt enables SSL for mosquitto_pub, and tells it where to look for root certificates. These are typically installed by your operating system, so the path is different for Mac OS, Windows, etc. mosquitto_pub uses the root certificate to verify that the Mosquitto server's certificate was properly signed by the Let's Encrypt certificate authority. It's important to note that mosquitto_pub and mosquitto_sub will not attempt an SSL connection without this option (or the similar --capath option), even if you're connecting to the standard secure port of 8883. We need to add one more listener block to our Mosquitto config. And reload the firewall one last time. Protocol should be wss (which stands for websocket secure). User should be your Mosquitto username; here, we used sammy. ClientId can be left to the default value, mqtt-admin. 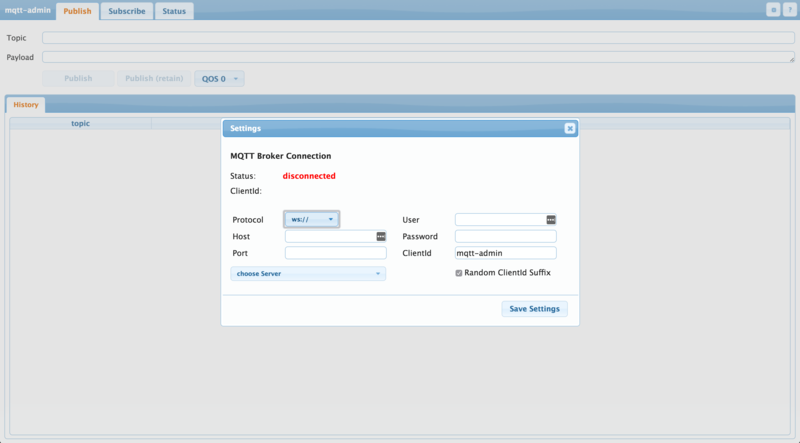 After pressing Save Settings, mqtt-admin will connect to your Mosquitto server. In the next screen, fill out Topic as test, enter any message for Payload, then press Publish. The message will show up in the mosquitto_sub terminal.